Carlos and Bernice Delos Santos after being presented with the 2017 Central Plateau Share Farmers of the Year title. As 2019’s regional entrants into the New Zealand Dairy Industry Awards will be focussed on putting their best foot forward during February’s judging events, one Central Plateau farming couple can attest to it being all worth it. Carlos and Bernice Delos Santos, who won the 2017 Central Plateau Share Farmers of the Year title and were named national runners-up, say entering the awards was one of the best career decisions they have made. The couple say they grew professionally and personally just from entering. This is our way of giving back to the awards and it is amazing to be involved in what will be a memorable event to future winners,” says Carlos. “We knew just by entering, that you got all these goody bags and vouchers and if you do a bit better then you start getting some serious prizes. The Delos Santos say the awards also made them realise just how important their family is, enabling them to prioritise their children and the time they spent on them. “Growing your business is one thing, being able to spend time with our three little children even though we are busy, priceless!” says Bernice. 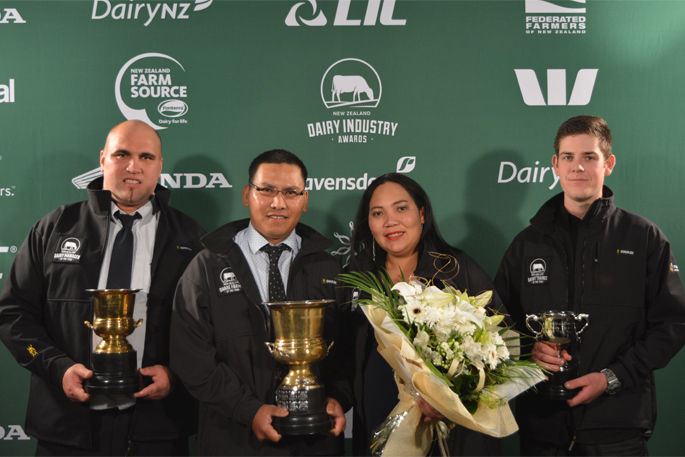 The awards are supported by national sponsors Westpac, DeLaval, Ecolab, Federated Farmers, Fonterra, Honda Motorcycles, LIC, Meridian Energy, and Ravensdown along with industry partners DairyNZ and Primary ITO.